There’s probably no better way to understand the geography of Franciacorta than the photo above. It was take a few weeks ago atop Mt. Orfano (Mount Orfano or MOHN-teh OHR-fah-noh in Italian). 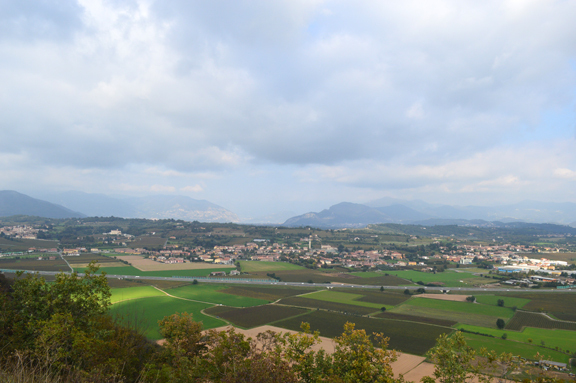 The mountain lies in the southwest corner of the appellation and from its peak, you can see Lake Iseo (Lago d’Iseo or LAH-goh dee-ZEH-oh in Italian), which marks the northern boundary of the appellation. Lake Iseo was formed when the ancient glaciers melted in prehistory. Look at the Google map below. 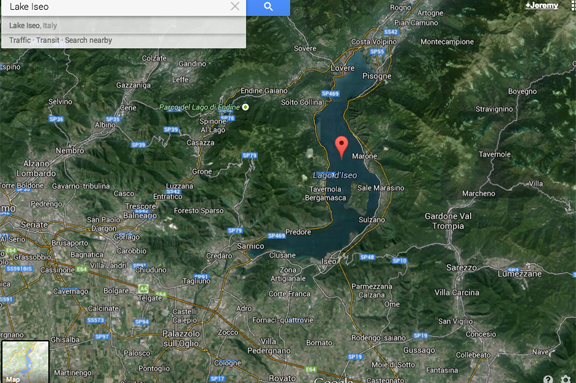 You can see the route of the ancient river bed that fed Lake Iseo at the top of the image. As the glaciers melted, they deposited their debris — stones ranging in size from boulders to pebbles — in the foothills and valley below. The hills that you see around the lake are so-called Morainic hills. Note how they jut out of the landscape violently. They were formed by the glaciers’ debris. Morainic hills like these dot the pre-Alps throughout Lombardy and the Veneto. And they are easy to recognize because of their distinct shape. Their ideal for the production of fine wine grapes: their rocky subsoils are nutrient poor and they create excellent drainage. These two factors force the vines to struggle in their search for water and nutrients. The more the vines are stressed by the this, the richer their fruit becomes. 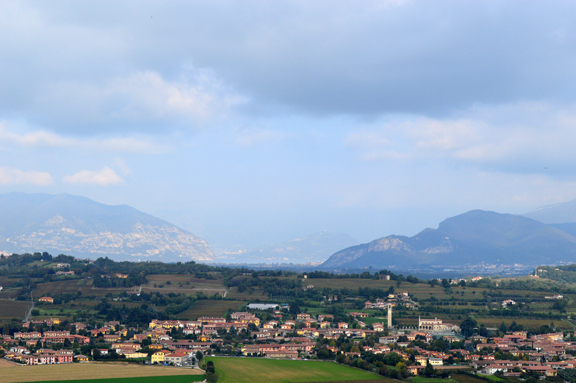 There’s a lot more to say about Franciacorta geography but this is a good place to start. In the photo at the beginning of this post, you can see the village of Erbusco and its tower in the foreground. In the photo below, I opened up my lens even more and you can see the highway, A4, in the foreground (use it as a reference with the Google map screenshot above).